Equipped with cushion comfort, arch and instep support, plus micro mesh panel ventilation. The smoothest & silkiest boot sock ever made. Each pair is individually hand-silk screened for greater detail. Powder-smooth, light and cool, silky to the touch, super-durable, athletic stretch adult riding socks. Powder smooth, light & cool super durable athletic stretch junior riding socks. Powder smooth, light & cool & silky to the touch, but super durable athletic stretch women's socks. Easy to color, fun sock coloring kit includes 1 pair tall sock & 4 permanent markers. Sparkle up your riding style with customizedhttp://secure.theoriginalhorsetackcompany.com/scart/public/admin/product/index.php/start/0 boot socks, permanent markers included. A streamlined take on a classic design, with high-tech nylon compression that supports & massages. Smooth & comfy year round tall boot socks with attention getting zipper design, in 3 cool colors. Made of cotton and spandex, for warmth and comfort, three stylish colors. Bamboo fibers are naturally moisture wicking and odor resistant, your feet will stay clean and dry. 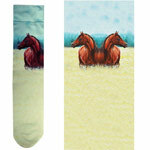 Equine Couture Ladies Roundabout Socks, warm and comfortable, stylish design in hot colors. Exselle Coolmax Boot Socks, warm, comfortable and stylish, in 3 colors, to match any outfit. The Jacquard Horse Pattern Woven Socks are the perfect blend of fashion and function! Leopard/Zebra print. These socks are 85% nylon and 15% spandex and are soft, stretchy and more durable then comparable brands on the market today. Paisley with Horses. These socks are 85% nylon and 15% spandex and are soft, stretchy and more durable then comparable brands on the market today. Designed for the ultimate in user comfort. The compression design naturally eliminates the problem of socks sagging down or bunching up in boots. Your feet will enjoy the winter with the new fuzzy, comfy heart design socks. Pick your favorite color! Traditional argyle socks in pink and grey with a pink horse logo. Heavy weight over the calf socks. These colorful kids socks have a horse shoe with stripes pattern. Kids Equestrian socks have a horse shoe in dot pattern. How cute are these! Little Pink socks with horses ready for a sleep over!